Isn’t it miraculous that our entire species processes various vibrations, trivial sequences of sounds, potent words, and perceives them as the expression of one’s sentiments and emotions? We call this enigma music. We breathe music, better yet, we swim in an ocean of a world, which is striving on musical power. Nevertheless, some people may misconceive music in general and think that it’s only used to communicate feelings towards lovers or to cope with grief, nothing else. However, studies have shown that music achieves far more: it helps people get emotionally rejuvenated in their daily lives, as well as treat us from various mental illnesses that we may suffer greatly from. In retrospect, has a song ever provoked an emotional response from you? For instance, a song you listened to on repeat during your recent poignant break-up, or a song you sang at your wedding, which compelled an earnest tear to roll down your spouse’s right cheek. Withal these potencies, the sheer power of music is still underestimated. In a highly dysfunctional world, artists of all kinds raise the voices of unprejudiced issues, and liberation in order to bring a sense of alignment to the planet through music. Music is therapy, a therapy everyone relishes in on a day to day basis. According to the US National Library of Medicine, National Institutes of Health, in the past 10 years, the “interest and progress in adopting music as a therapeutic tool in neurological rehabilitation” has inordinately increased. Hence, music can also be used as a therapeutic tool to assess the cognitive ability of people who have advanced Alzheimer’s disease – (a disease which has no known cure till date) , who indeed “respond to the evocative powers of music” 4 . Furthermore, a sensational performer, Matt Giordano, “uses drumming to help control his Tourette syndrome”7. Personally speaking, I feel my heart with song; music is engraved in my every memory. Due to my father’s rousing career, I have traveled to many places. Thus, the only constant in my life would have to be my music. Music has helped me pave my way through arduous times that I have come across, during my life. According to the American Music Therapy Association it is proven that music does provide “positive changes in mood and emotional states”. Hence, whenever I used to migrate into a new environment and a gust of loneliness suddenly used to take over my entire being, I would spend my time playing music; it transports me into a sarial world, eradicating all pain and sorrow in life. Furthermore, according to ‘Plato’ (A philosopher in Classical Greece), “musical experience is not an autonomous affair, isolable from other arts or the business of daily living.” 3 This proves to show that music is abstractly conjoined within our “daily” functioning. Therefore, we are always, whether it be consciously or unconsciously, involved in some type of musical endeavor. He mentions that “musical harmony’s primary value lies in what it does for mind and character.” Thus, character development is also an area which music nurtures in absolutely anyone in this world, no matter how old or young. Therefore, music’s unprecedented powers cannot and should not be underestimated. While in the past two decades there have been advances, neuroscience engineers and scientists have still yet to discover the true essence of the question; why does music have so much power? That is the underlying question for humanity; the beat of the drum of the human heart. We all know its power, yet we cannot put it into mere words. That is the paradox of music itself. 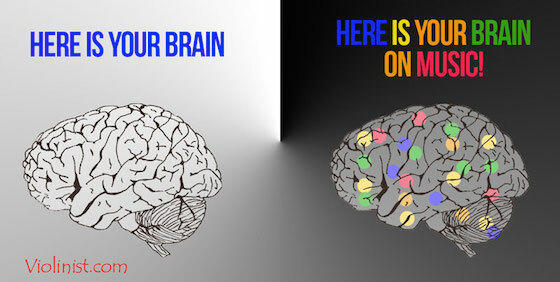 Image Credit: “Your Brain on Music.” Violinist.com, www.violinist.com/blog/laurie/20147/16023/. I think bolding your keywords effectively gave emphasis to your main points and helped me understand your claim much easier. Furthermore, your use of evidence was very persuasive and the anaphora at the end of your article left a lasting impression on me.